Jeremy Barr is a writer and journalism student. A native of suburban Maryland, he now lives in Mount Vernon Square. He last wrote about Green Hat Gin. In early December, I noticed a police truck attached to a light tower on M Street NW between 4th and 5th streets (pictured). A few days later, the light was set up near my house, a few blocks away. It was switched on late at night and stayed on until morning. I spoke with an officer on the scene, and he said that the light was a response to two recent muggings in the area. Angled as it was, the police light made our living room ceiling light almost unnecessary, cutting down our electricity bill dramatically, I’m sure. But after only a handful of nights, just as we were starting to get used to it, the police truck and light disappeared. I checked with a spokesman for the city police department to find out more, and heard back from Lieutenant Derek Larsen, who patrols the encompassed area, Police Service Area (PSA) 308. Larsen said that each of the Metropolitan Police Department’s patrol districts has a light tower assigned to it, and that in this case, the department immediately saw results. This light tower showed up on both sides of the Harrison Square complex (13&W) after a mugging the night before. Below is an email we received from a resident. Apologies for the scary email but better that people know and will be alert. Monday night, a little before midnight, a Harrison Square resident was robbed at gunpoint on 12th place by the parking alley and V street. There were two or three assailants, and they were likely hiding near the bushes at the entrance way to the courtyard underneath the decks. No injuries, but wallet and phone were stolen. 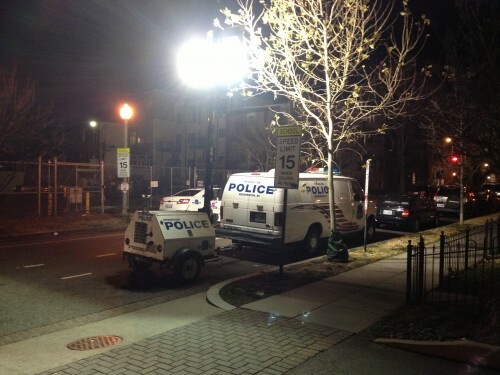 The criminals ran off towards U street – no news yet on whether anyone has been caught. Police arrived quickly and a full report was made.